Raising four kids on a budget…from toddlers to teenagers. I’m always on the look out for something new to do with meat. I can’t spend month after month recycling the same tried and true recipes. I have to constantly change things up, occassionally surprising everyone with an old family favorite that we haven’t had in a while. It makes everyone more appreciative, and more adventurous in light of their ever expanding palate. The sons took one look at these and dubbed them lettuce ‘tacos’, they took one bite and couldn’t get enough. I served them with some fried rice and a steamed Asian vegetable blend. Who has the time for an expensive family feast at P.F. Changes? I certainly don’t. Now, there’s no need. Tangy beef with a perfect hint of spice is wrapped in refreshing lettuce leaves in this quick and easy Asian lettuce wrap recipe. 1. Heat the oil in a heavy frying pan, then saute the beef until it’s cooked through and starting to brown, breaking apart with a turner as it cooks. 3. When the beef is done, add the Sriracha Sauce mixture and let it sizzle until the water has evaporated, stirring a few times to get the flavor mixed through the meat. Turn off the heat and stir in the lemon zest, lemon juice, sliced green onions, and chopped cilantro. 4. Serve meat mixture with iceberg, or artisan romaine, lettuce leaves to fill with meat and wrap around it, to be eaten with your hands. 5. This was definitely still good when the meat mixture was kept in the fridge and reheated for a very short time in the microwave, but I still liked it best freshly made. 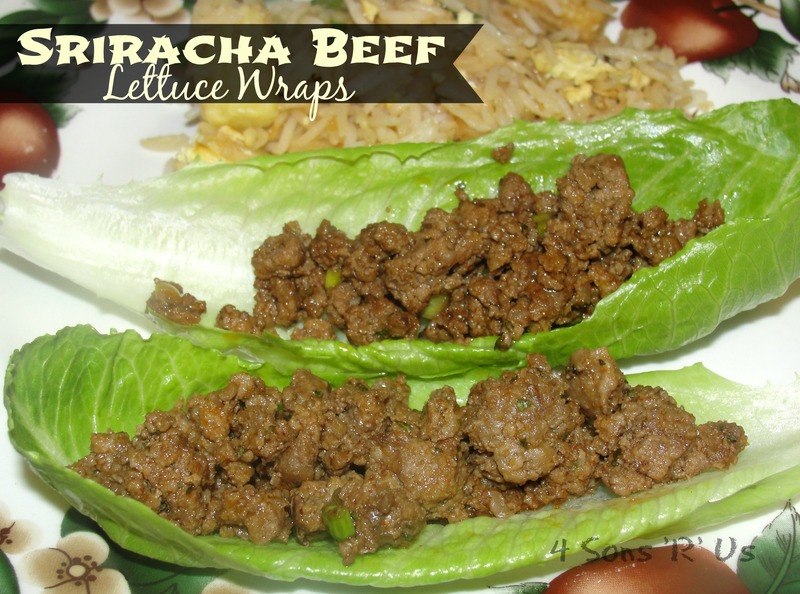 Posted in Recipes and tagged asian flavor, Asian lettuce wrap recipe, dinner, ground beef, iceberg lettuce, lettuce wrap, lunch, Sriracha, Sriracha beef. Bookmark the permalink. I always have ground beef on hand. I get the best bang for my buck on lean ground beef by purchasing it in bulk at Costco. I come home and package it in meal sized portions, and then store it in the freezer. Knowing I’ve always got ground beef on-hand ready to defrost for supper, I’m always on the lookout for something ‘new’ to do with it. When I found this Six Sisters’ recipe and tried it, it was amazing! Simple, easy, and satisfying anytime I’m craving those ‘Asian’ food flavors. Save money, and forgo ordering out. Make your own meal, at home, tonight and still get your fix. Heat a large skillet over medium high heat. Brown the ground beef, with the garlic, in the sesame oil. Drain most of the fat. Add brown sugar, soy sauce, ginger, salt, pepper, and crushed red peppers. Simmer for a few minutes to blend the flavors. Serve over cooked rice and garnish with green onions. 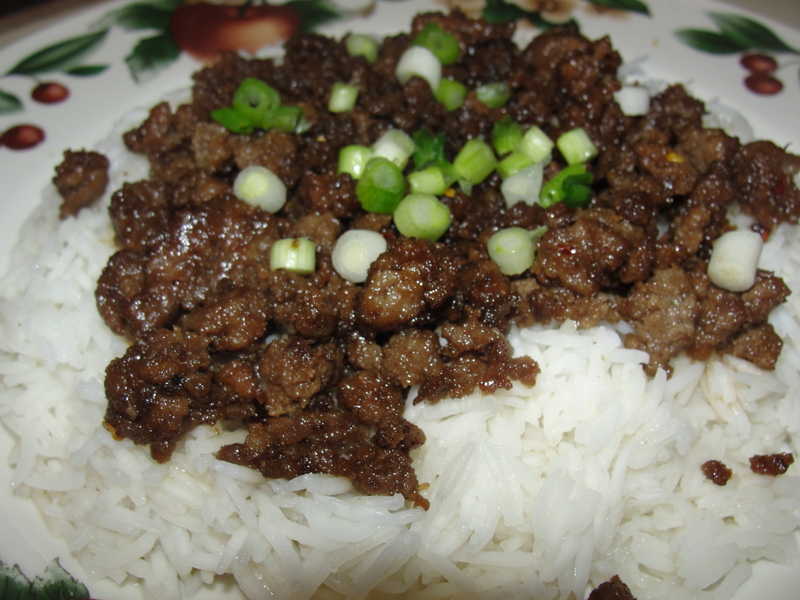 Posted in Recipes and tagged asian flavor, basmati rice, dinner, easy, ground beef, quick, sesame oil. Bookmark the permalink. Hi! I’m Meaghan. Welcome to my virtual kitchen & craft corner. Pull up a chair, stay awhile and follow along with us and our 4 sons. Can I get you a glass of wine? Some coffee? Pretzels or cheese sticks? While I can’t actually give you these thing online, I can show you how to make them… on a budget! Strawberry shortcake pancakes put classic strawberry shortcake flavors into a delightful pancake recipe. These fluffy pancakes will delight everyone at your breakfast table with their easy and sweet strawberry topping. Get the #recipe on our site at www.4sonrus.com or by clicking the link @4sonsrus. This easy marsala chicken and rice casserole has all the classic flavors of chicken marsala in an effortless casserole. Rich, savory mushroom gravy covers tender shredded chicken and fragrant jasmine rice for a hearty, crowd pleasing casserole. Get the #recipe on our site at www.4sonrus.com or by clicking the link at @4sonsrus.